NEW Premium quality shot glass with thick base and scalloped rib surface. 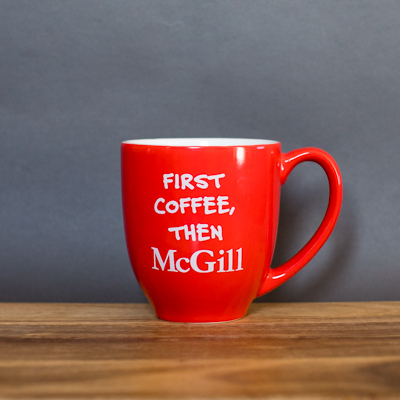 Take your tea or coffee with you, McGill-style. 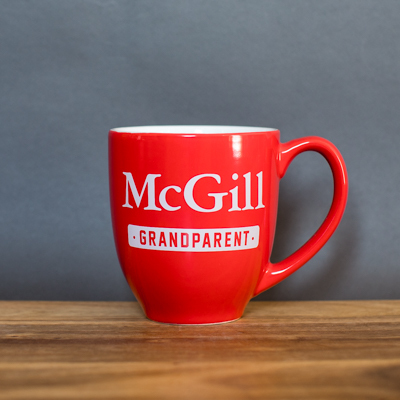 Take your tea or coffee with you, McGill-style. Our ceramic tumbler features a push-on lid with slide closure and fits in most standard cup holders. 15 oz. Handwash only. Keep quenched with this glass water bottle wrapped in a full silicone sleeve. Keep quenched with this glass water bottle wrapped in a full silicone sleeve. Features a screw-off lid with carry loop for easy portabiliity and a McGill University print on the sleeve. Add a little class to your glass of water, coffee or tea! This 10 oz glass mug features a handcrafted pewter McGill shield. Keep Calm and Call Mom! Large ceramic Bistro mug with Keep Calm and Call Mom decal in red. 16 oz. Dishwasher and microwave safe. Need a little love before your fist cup of joe? Our McGill mug is perfect for that! Bold colours go a long way, even when you're just grabbing a cup of coffee. Bold colours go a long way, even when you're just grabbing a cup of coffee. 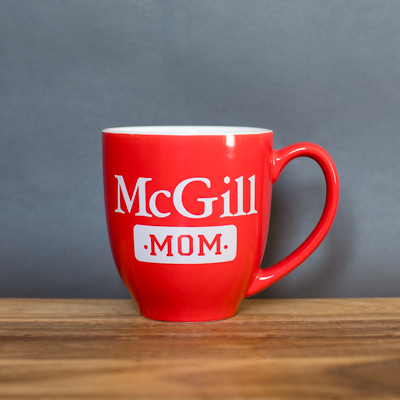 This McGill ceramic mug proudly rocks the school's red, features a laser-etched logo and is 100% dishwasher safe. 14 oz. Hydrate without warming the planet! Hydrate without warming the planet! Our latest and greatest sustainable stainless steel water bottles have arrived… McGill printed logo on matte satin finish in red and silver. 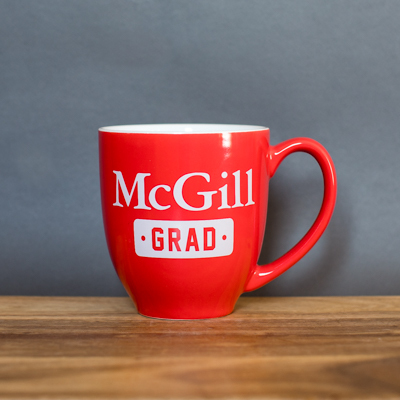 Take your cup of joe on the go, McGill-style. Quench your thirst and help save the planet! Quench your thirst and help save the planet! McGill Stainless steel straw set: 1 straight straw, 1 bent straw and a cleaning brush. All 3 conveniently packed in a drawstring cotton bag. 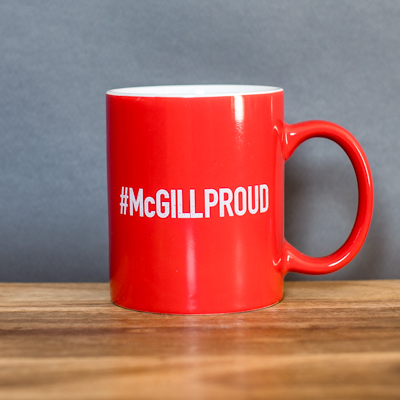 Show you are #McGillProud with this high quality ceramic mug with red exterior and white interior. 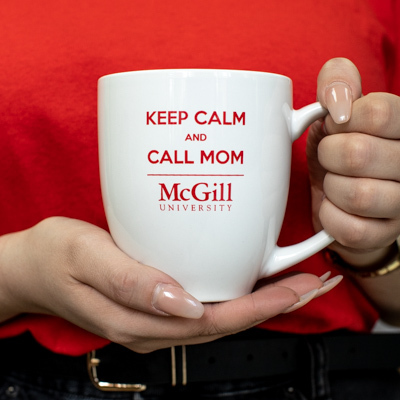 Show you are #McGillProud with this high quality ceramic mug with red exterior and white interior. #McGillProud decal front and back. Dishwasher and microwave safe. 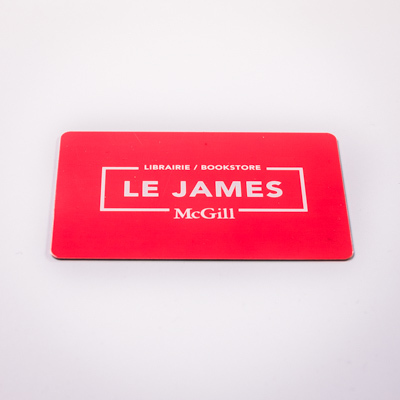 The perfect gift for any McGill Alumni. This classic coffee mug is great for coffee, tea or to show off your Alma Mater. 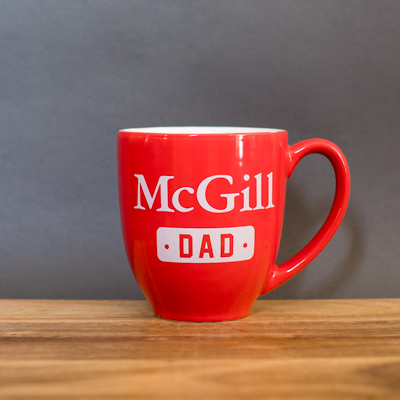 The perfect gift for any McGill Alumni. This classic coffee mug is great for coffee, tea or to show off your Alma Mater. Ceramic mug with red exterior and white interior. McGill Alumni decal front and back. Dishwasher and microwave safe. Your mom will think of you every time she has coffee in her bistro-style mug. Your mom will think of you every time she has coffee in her bistro-style mug. This large ceramic mug holds 16oz and has a red exterior with white interior. McGill Mom decal front and back. Dishwasher and microwave safe. Your hard work has paid off and you are now a McGill graduate. Show it off with this bistro -style mug! Your hard work has paid off and you are now a McGill graduate. Show it off with this bistro -style mug! Made of high quality ceramic, it has a 16oz capacity, red exterior and white interior. McGill Grad decal front and back. Dishwasher and microwave safe. Stay hydrated, McGill-style. An easy-twist lid and quick-clip carabiner top allow simple attachment to backpacks and gym bags. Stay hydrated, McGill-style. An easy-twist lid and quick-clip carabiner top allow simple attachment to backpacks and gym bags. Vibrant red finish with white McGill wordmark and crest. 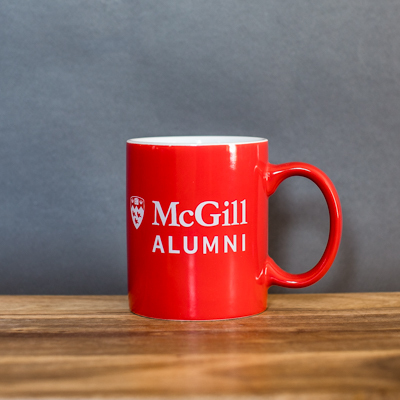 750 ml, 2 7/8" x 10"
Drink proudly from this McGill Alumni ceramic mug! 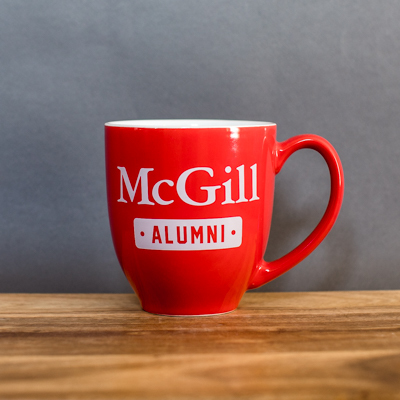 Drink proudly from this McGill Alumni ceramic mug! It has a large 16 oz capacity, a red exterior and white interior, and McGill Alumni decal front and back. Dishwasher and microwave safe. Cheers to McGill! Celebrate our history and tradition with our officially branded beer stein. Cheers to McGill! Celebrate our history and tradition with our officially branded beer stein. Sip from 20 oz of finely crafted stainless steel emblazoned with the McGill crest. The perfect gift for any proud grandparent! This large capacity McGill mug is holds 16oz , has a red exterior and white interior. Heavy-duty glass beer mug with scalloped rib surface. First coffee, then McGill. Start you day off right when you drink from this 16oz ceramic mug. First coffee, then McGill. Start you day off right when you drink from this 16oz ceramic mug. Red exterior, white interior, with First coffee, then McGill decal front and back. Dishwasher and microwave safe. Stainless steel flask with curved form and sized to fit perfectly in a back pocket. Stainless steel flask with curved form and sized to fit perfectly in a back pocket. High-polish, satin-finish surface features raised McGill crest with red enameled accents. Captive screw top with hinge keeps cap close. 8-ounce capacity. Rust-proof. Nothing beats a shot of McGill pride! Carry your H2O anywhere when you are on the go! 24oz push button drinking spout with lock makes it easy to sip and less likely to drip!